The PC can be the CAN host, monitor or HMI to access/control the CAN device through the CAN network by the I-7530 converter. The programmable RS-232 device (For example: PACs of ICP DAS) can use the serial port to connect to the CAN network via the I-7530 module. 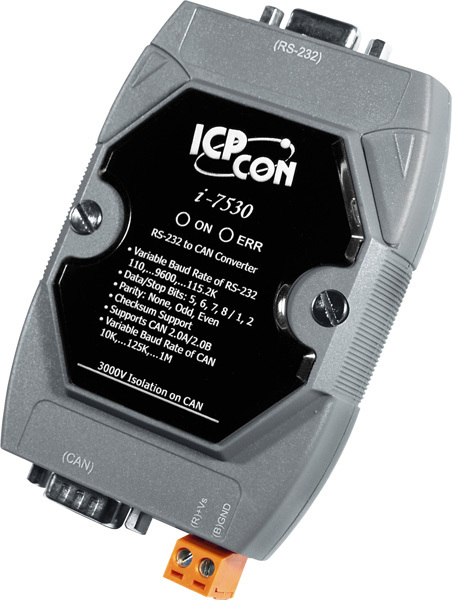 The I-7530 is designed to unleash the power of CAN bus via RS-232 communication method. It accurately converts messages between CAN and RS-232 networks. This module let you communicate with CAN devices easily from any PC or devices with RS-232 interface.